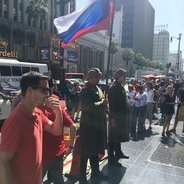 When Donald Trump’s star on the Hollywood Walk of Fame was destroyed last week, a group of geniuses dressed as Russian soldiers and stood guard over it. See it below. Given how hot it is, this is dedication to the cause of trolling.